Doritos is making a millionaire for the tenth and final time with its Crash the Super Bowl ad contest. There are three finalists for this year's annual contest for the best Doritos commercial. One of them will win $1 million and have his 30-second spot aired during Super Bowl 50 on Feb. 7. PepsiCo (PEP), the owner of Doritos, will set up the winner with a "dream job" working with Warner Bros. Pictures and DC Entertainment. The winner will collaborate with Zack Snyder, director of the upcoming movie "Batman v Superman: Dawn of Justice," starring Ben Affleck. The other two finalists will each win $100,000. They won't know who wins until the ad airs during the game. The winner will be decided by online voters at the Crash the Super Bowl web site. The finalist videos are "Doritos Dogs" by Jacob Chase, a TV and movie writer from Los Angeles; "Swipe for Doritos" by David Rudy, a talent manager also from Los Angeles; and "Ultrasound" by Australian filmmaker Peter Carstairs. 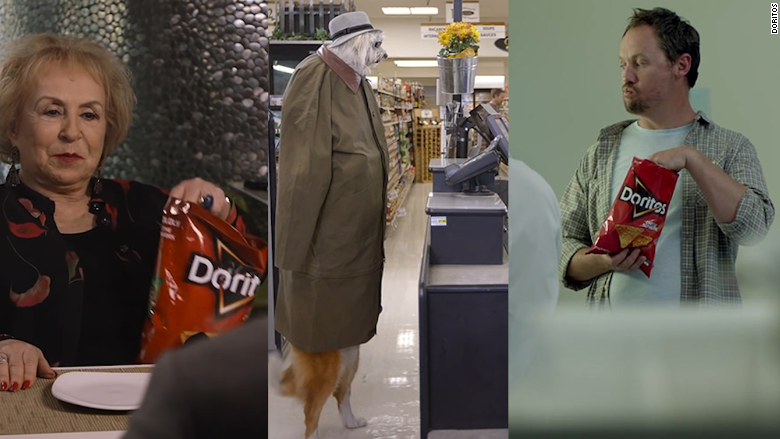 Three Doritos ads are vying for $1 million prize. Carstairs, 45, made his ad on a $2,000 budget. It features the touching moment when a couple first sees an ultrasound image of their child, and the baby can been seen trying to get at dad's Doritos. "Swipe for Doritos" is about online dating, where a bag of Doritos serves as a useful icebreaker for a pair of potential lovebirds with a significant age gap. Rudy, 42, spent $4,500 and used some recognizable talent, including Doris Roberts of "Everybody Loves Raymond" and Kelly Washington of "Jurassic World." In "Doritos Dogs," the pooches take drastic measures to get their paws on Doritos. Chase, 29, said that he's been dreaming about stacking dogs in a "trench-coat totem pole" ever since he was a child and got the idea from a cartoon. He used $1,000 and several dogs to make the ad. Doritos, which has been holding the competition for 10 years, said this is the final year.